1. Choose the 4th folder where you store pictures on your computer. 2. Select the 4th picture in the folder, and post it on your blog. 4. Tag four people to do the same. 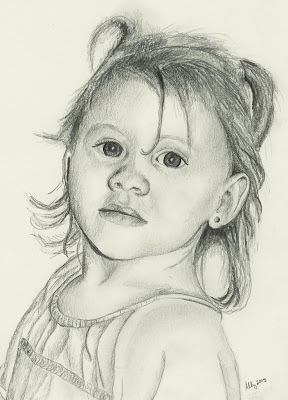 This is a drawing of my niece Aubrey I did when she was 2 years old. Weird what that kind of search does! That's ok. I kinda never got around to letting anybody know they got tagged. Loved the pic! We actually just pulled those pics out 3 days ago as we were hanging stuff up on the walls....finally. I was wishing we had drawings of the newer 3 since the youngest ones at the time were G & G. So..you've got 3 more to catch up on. :) I was thinking too that at some point when Brad and I finally narrow some pics down that we want in frames you and I might could go picking out some frames and do a picture wall down the long yellow hallway. I love your wall and Brad thinks some black frames on the yellow would be so great.